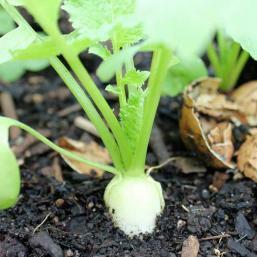 The radish is a vegetable that has got many a young grower into gardening. Radishes are my first memory of growing food as a boy. My dad would gently pour the small round seeds into dampened and folded strips of newspaper laid along shallow furrows in the ground. Then he’d brush a thin layer of soil over the top and within three to four weeks magic had happened with orderly rows of feisty red globes ready for the pulling. 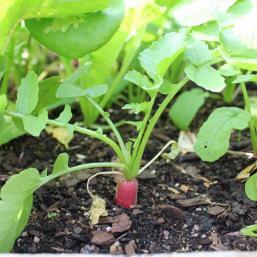 An exciting taste explosion for young palettes, radishes – like carrots – are instant food that needs no finessing. Radishes were so popular in ancient Greece that they even made solid gold replicas of them. Once you get into growing the standard round red globe radishes you can explore the peppery delights of adventurous varieties such as the Daikon – or ‘Chinese’ – radish with its thumb-thick, cylindrical white stems that will grow longer than your hand. They are a bit of a star in the kitchen. Companions Peas, lettuce, chervil, parsnip. Quantity 6 per person as repeated sowings. Click through to view seed options. Sparkler round, open pollinated variety producing small rounded roots with red top and white bottom. Fast growing crisp and crunchy. Best harvested when just wider than your thumb. Sow from early spring to late autumn. French Breakfast cylindrical, heirloom variety with long scarlet, red roots tipped in white. A fast grower, mild in flavour. White icicle(garden peas) heirloom variety with, tapered roots that grow about as long as your hand. Mild, juicy and crisp. Sow in spring and autumn. Daikon a large, white rooted Japanese variety. Sow in autumn. 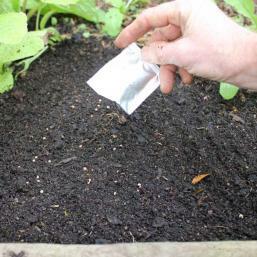 Can be sowed almost year round in warmer parts – except perhaps for June and July. In cooler parts best sowed from August through to early May. 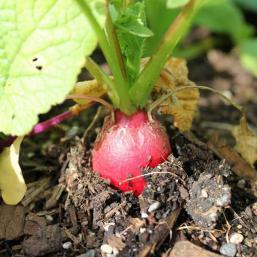 Radishes generally grow best in cooler conditions but they will prefer a sunny spot during the colder months of the year. They are so quick you can grow them in between rows of longer maturing roots such as carrots and beetroot. 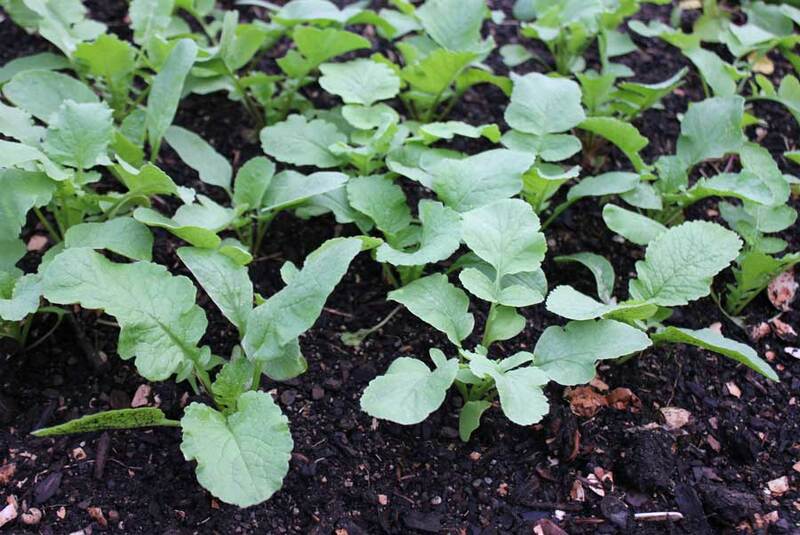 In the warmer months they are better grown in light shade – which again makes them ideal between lettuces, bush beans and silverbeet for instance. Ideal for container growing too. 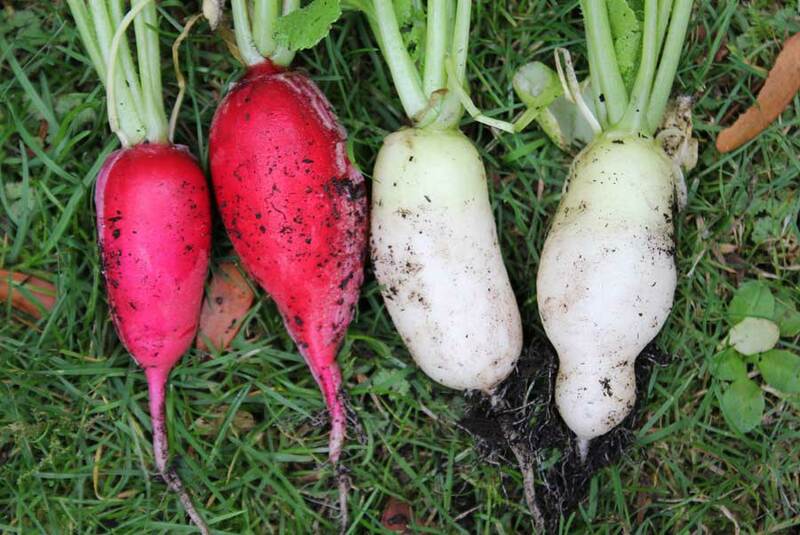 Radishes can be planted alongside rows of slower growing vegetables like parsnips – which can take up to 3 weeks for their seeds to show signs of sprouting. By this time any radishes you have sown will clearly mark the position of their slow coach neighbours so you don’t inadvertently disturb them. 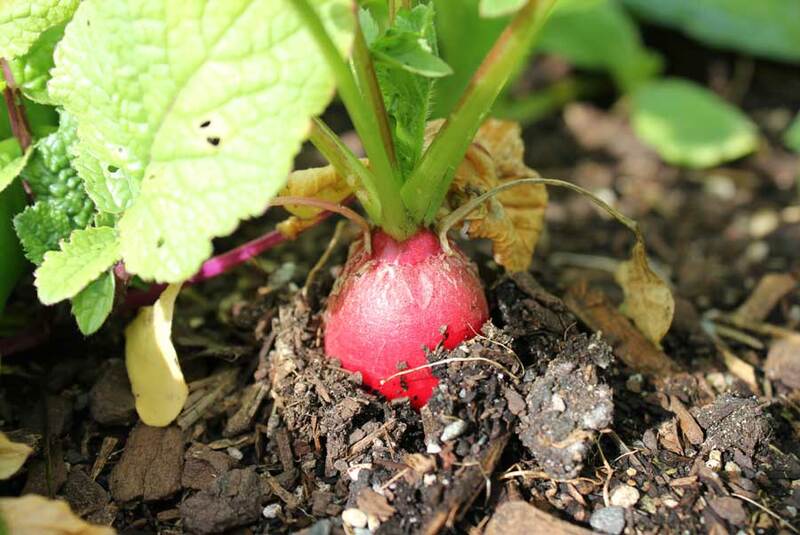 Radishes are fairly easy going but it helps if you can provide them with a loose, sandy soil that allows their roots to easily penetrate and fatten up. 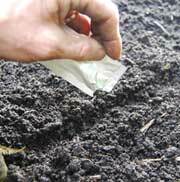 Dig your planting area well to break up soil particles. 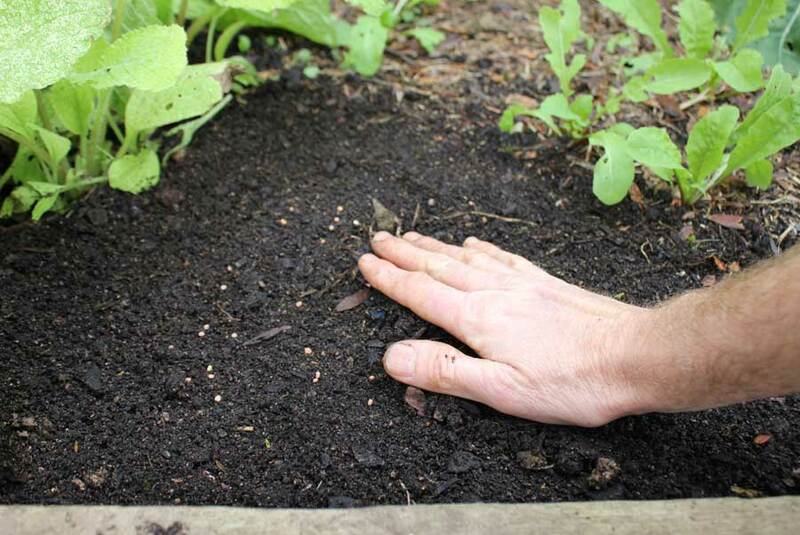 If your soil particles are not keen on breaking up then it might be worth adding some coarse sand or fine pumice to it to help loosen things up. 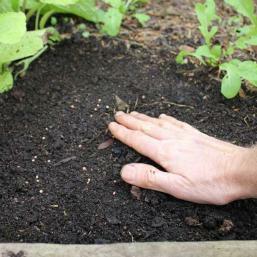 Drag a rake over the surface to level it and remove any stones which might get in the way of your rapid red roots. My dad’s method of dragging a finger-tip deep and thumb-wide trench across the soil before laying strips of dampened newspaper in it helps you see how many seeds you are sowing – they can all come rushing out of the packet so fast you end up with about 10 ten times as many as you want in your row and they can be difficult to see against bare earth. Clever seed people are now selling radish seeds pressed into paper tape to help achieve correct spacings. 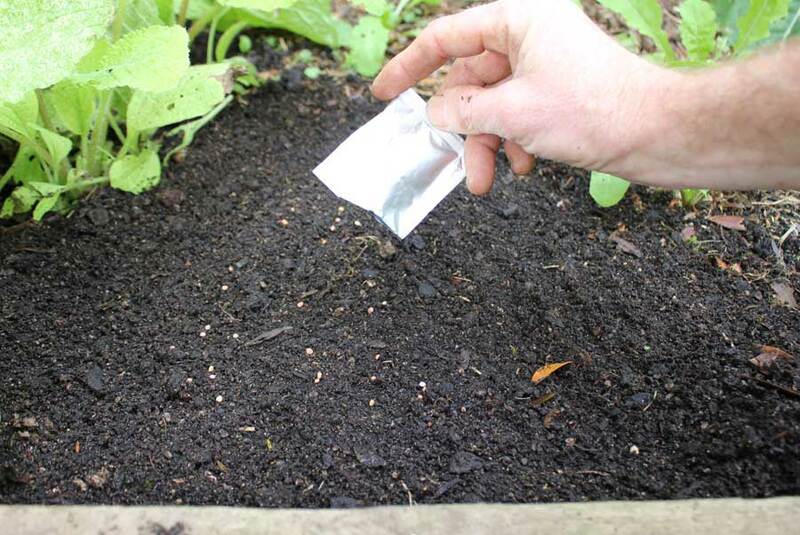 The other benefit of using damp newspaper – more for summer really – is that it helps hold moisture around the seeds as they germinate. Ideally you should sow about one seed every little finger width in rows that are about a hand’s length away from whatever they are growing beside. 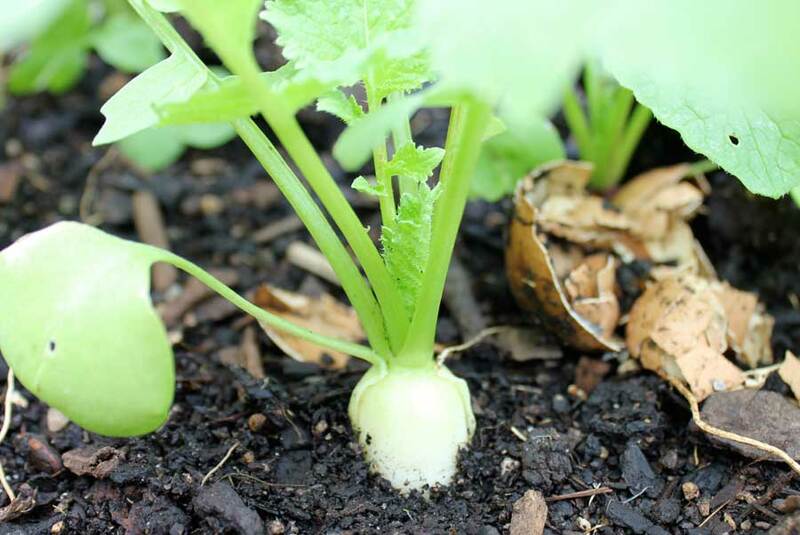 Once your radish seeds have sprouted – should be around a week after sowing – you can thin them so that you have radishes growing about a thumb’s width apart from each other. 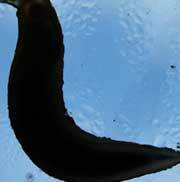 Despite their speed, radishes are very popular with slugs and snails too and this can stop them in their tracks. It does not take long for the pleasant sight of a crowded row of rounded young leaves to be reduced to empty stalks – so be on the look out. 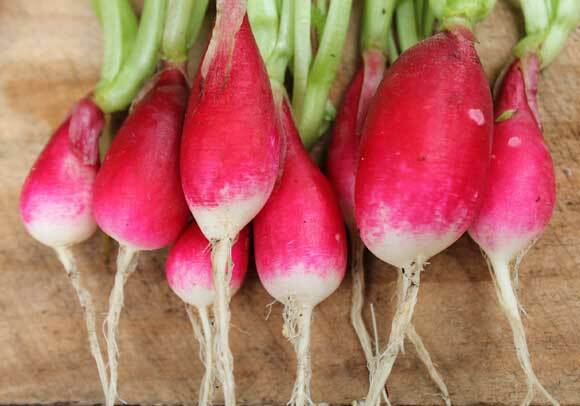 Small red radishes can be ready in as little as three to four weeks depending on variety – the likes of Daikon (meaning ‘Great root’)take more like eight to ten weeks. 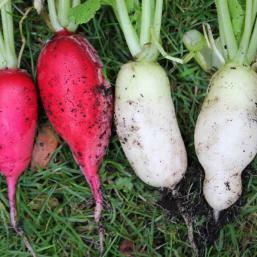 Pull your radishes when the roots show that they are swollen – you will probably have enough to test on a daily basis. Some folks grow radishes for their leaves and cut the foliage when it is about a thumb’s length in height for throwing into salads. 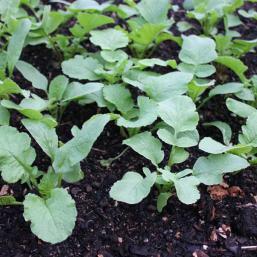 Alternatively, radish leaves can be left to grow to about a full hand’s length and then cooked like spinach. 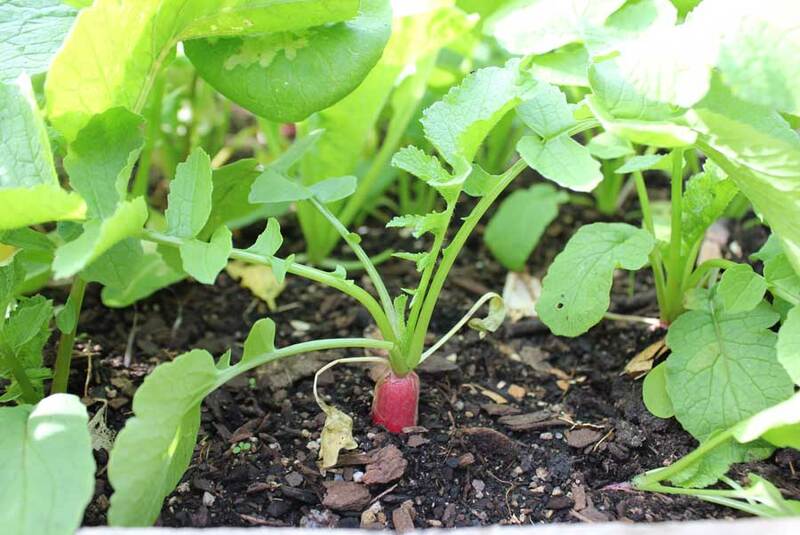 Don’t sow all your seeds at once – there are only so many radishes you can eat in a day so save seed and repeat sow every few weeks.